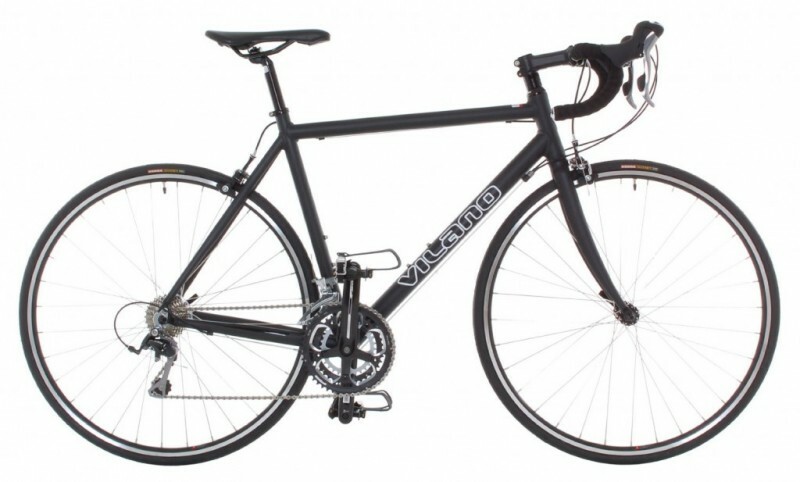 The Vilano Performance 700C, 21 Speed Shimano Hybrid Flat Bar Commuter Road Bike is a unisex bike that comes in 3 distinct sizes and 3 different color schemes for both men and women riders who are taking to the road for fitness or commuting. Coming in 50cm, 54cm, and 58cm, this road bike is perfect for most riders, however, for shorter individuals, even the 50cm may be too large. This road bike contains a 6061 Aluminum Aero Performance Hybrid frame with an integrated headset. The compact frame provides a comfortable fit for the rider, and the bike contains alloy linear pull cantilever V-brakes as well as double wall alloy rims. 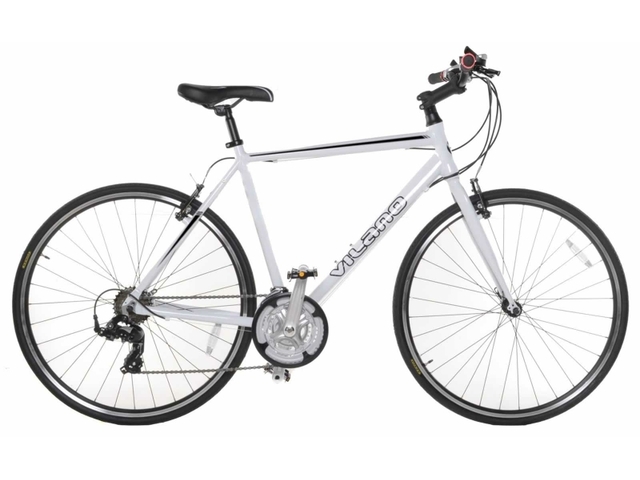 With Black, White, and Grey to choose from, this Vilano is not intended to be a highly visible bike, but a beginner’s bike that offers functions such as the 21 Speed gear that more expensive models have. This bike was designed specifically as a performance commuter bike for on-road usage. At a weight of 25 pounds, it is a couple of pounds lighter than heavier road bikes on the market. The Vilano performance hybrid bike offers Shimano components for fast, fun fitness riding and commuting. It features a 6061 Aluminum frame with aero tubing and an integrated straight blade fork. 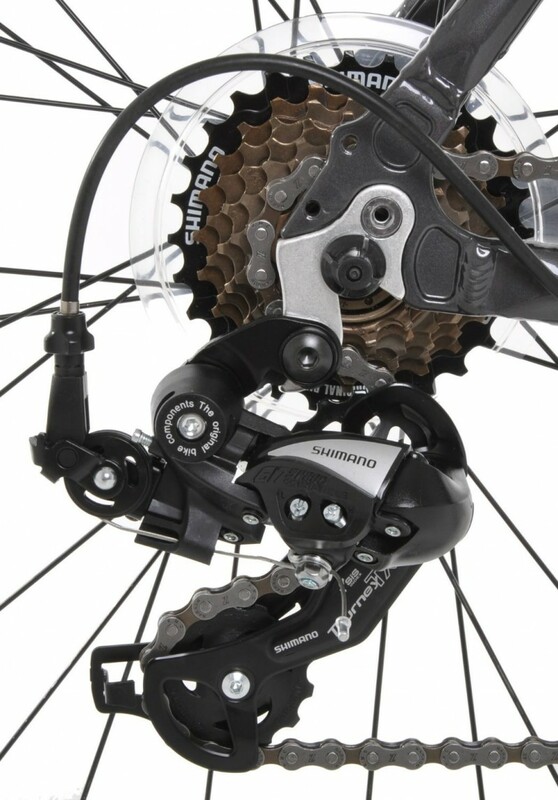 The Shimano components provide fast reliable gear changes. Additional features include water bottle mounts, rear rack mounts and ergonomic comfort saddle. Other aspects of this bike that are great are the sealed cartridge of the bottom bracket, steel fork, and the KMC Z chain. 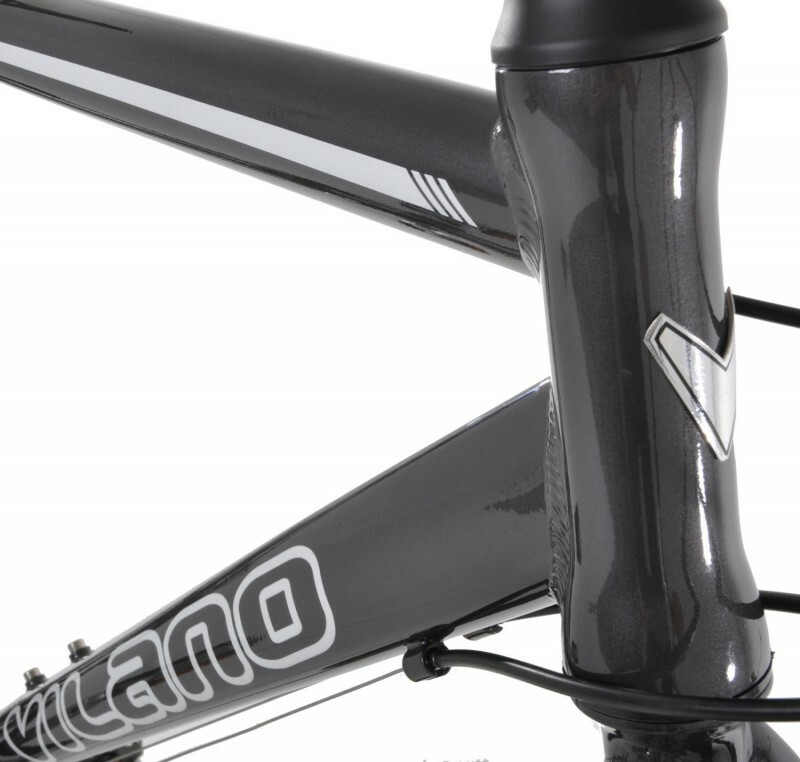 The Vilano brand has been known to make their road bikes with cheaper materials—especially the components and tires. The chain on other Vilano models has been known to have problems, including snapping and breaking. By using a chain made by KMC, this offers better quality material in this model. The crankset is also better than other Vilano models in that this model utilizes a ProWheel Triple with chain guard (48/38/28T). This is a much better crankset than other road bikes in this price range and an attempt by Vilano to make their Performance road bike model of better component quality than others. As stated before, Vilano has a reputation of using some inferior materials to build their bikes, and this often causes problems for those forking out the money to buy of one of these models. While this is a beginner’s bike in the $199 to $300 bracket, riders do expect some quality still. One of the negative aspects of this bike is something that Vilano has an issue with regarding all of their inexpensive road bikes: the quality of their materials. Unfortunately, rather than using steel, this bike has an aluminum frame, an alloy stem, alloy riser, alloy seat post, and Kenda tires. While the fork is made of steel, the rest of the bike uses the same aluminum and alloy that has posed many problems for the overall functionality of the bike for riders. The Kenda tires are something that Vilano has had substantial issues with, and yet they equipped this model with the 700C x 28c tires by this brand. This has led to quick flats on the road. However, for some users, this is not an issue—for those who intended on using this bike gently for commuting purposes or a fitness ride around the neighborhood, these tires can hold up without any problem. However, for many riders who intend on entering the biking world, want to put some miles on their bike. Those who have taken this bike long distance, naturally encounter rough road conditions occasionally, and the Kenda tires are just too thin and cannot take much of rough asphalt. 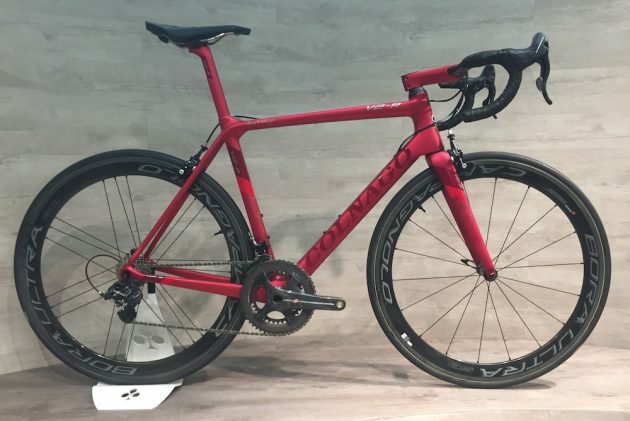 The highlight of this Performance Hybrid Road Bike by Vilano, is the Aero Performance Hybrid Frame with an integrated headset. This frame features a Flat Bar and offers a more aerodynamic action to this bike than the standard road bike offers. The Double Butted Aluminum holds up well as a replacement to a steel frame, and considering that Vilano has learned from some of their previous mistakes and used some name brands including KMC and Kenda, the component parts are actually pretty decent for a road bike in this price bracket. The functionality of this commuter/road bike is very decent—it is important to assemble and tune up this bike at a professional bike shop, just like any other new bike when purchased. 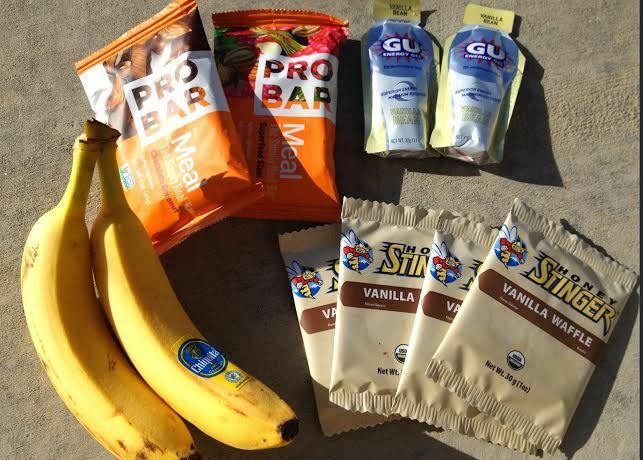 This will ensure much better and solid functionality made for you and your body. For fitness riding, commuting, and road use, this bike’s brakes, frame, shifters, and gears actually held up well on the initial bike ride as well as months later, without issue. While this bike is by no means a professional bike or even a racing bike, the 21 Speed gears allow for fast biking for fitness, commuting to work, and riding for fun. This is a pretty good beginner’s bike that can acclimate the rider to the world of biking without draining their wallet. Depending on the size of the frame you purchase (50cm, 54cm, or 58cm), you can buy a White, Black, or Grey model for between $239.00 and $300.00 on Amazon. This is an extremely decent price for the components used and the overall design of this performance model. 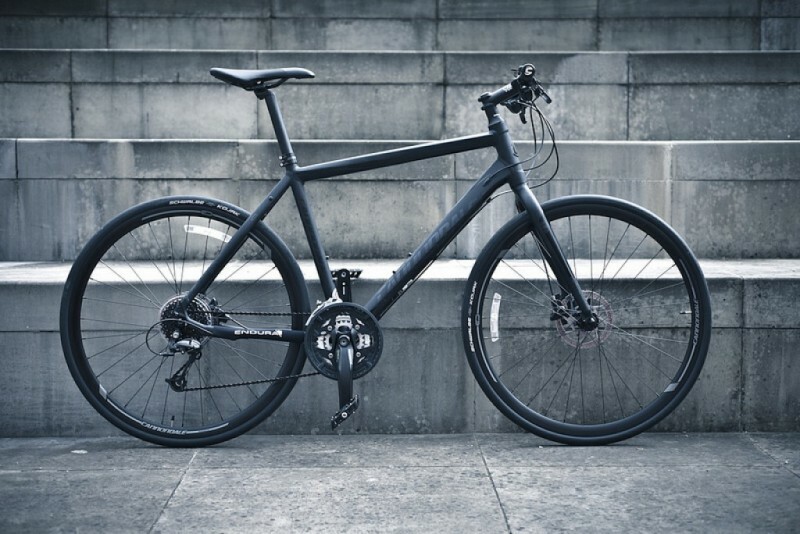 This commuter road bike by Vilano is definitely a mix between being impressed at the progress Vilano is making towards creating better quality materials and components for their bikes, as well as being disappointed at running into the same problems again. 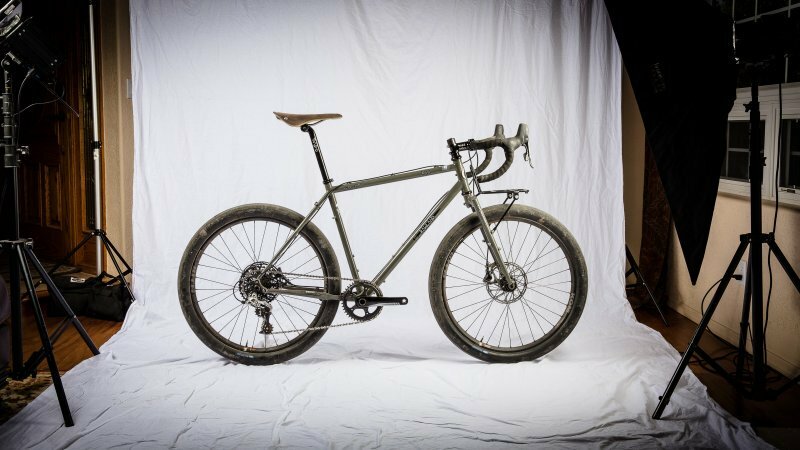 For this model, it makes sense to have an aluminum frame, as it is an Aero Performance Hybrid Frame, which would make the bike too heavy should it have been made using steel. However, most of the components are made of alloy and while improvements have been made to make this Performance 700C bike better than its predecessors, there were still some issues for some bikers with the Kenda tires being too thin and encountering flats during casual road use. The overall quality of this road bike is far better than was expected of Vilano and most beginners will have no problem with this 21 Speed bike. In fact, for the price and quality, this is an excellent deal for a novice to get into gear as a new rider. With three sizes and colors to choose from, you can customize a bit to your own preferences. The functionality is very decent for commuting to work or the park, fitness riding, and casual usage on the road both for short distances and long. The components actually hold up extremely well in this model and as long as the rider assembles this bike appropriately (this is why it is highly recommended that you take your bike to a local shop to be tuned up for you), this Vilano Performance is not a bad model to start off with until you know more as a rider and can afford a higher grade bike if you choose to stick with it.